Freeplane is a widely used mind mapping tool. GTD is a time management methodology by David Allen. Freeplane GTD is an addon, that can collect tasks specified in a mindmap, thus allowing the users of Freeplane to use the concepts of GTD in their mind mapping tool. Please visit this page, to see all articles about the add-on, including the release announcements and how-tos. Download and install Freeplane on your computer. In Freeplane open the addon manager, select the previously downloaded addon, and install it. You can now use the addon. Please be aware, that the addon will replace any previous version of FreePlane GTD. Select Tools -> Freeplane GTD -> Next Actions from the menu. As of version 0.9 the addon can be invoked using the pre-defined hotkey Ctrl-H. The main window of the Freeplane GTD addon will contain all the action items (annotated with the corresponding icon) of the current map. You can close this window using the window buttons, or the ESC hotkey. The sidebar of the window contain the different groupings of the tasks. In order to speed up the action entry, shorthand notation can be used to add new items. These shorthand notations will be parsed upon the display or the refresh of the task overview window. The parsed items will be annotated with the task icon and the extracted attributes will be added to the task. The format of the shorthand notation is as follows. Please note, that the position of the attributes do not matter. The first character of the notation must be an “*”. The plugin uses a number of pre-set icons to identify the action items, and their properties. These can be changed according to the users liking. Icon: Done – Once an item is completed it can be marked as done. To customize these icons you must place a node with the text above anywhere in your map and add a desired icon to that node. I suggest you place it under a “Config” or “Settings” node in the root of the map, so it doesn’t get mixed up with the actual map content. If you want to add pre-defined icons for some contexts specified in your action nodes, it’s available for versions over 1.0. To use this feature you must create icon nodes such as the ones above with the text “Icon: @Context” where the Context text can be replaced with the context of your liking. The icons specified will be converted to the corresponding context attribute (Where property). Freeplane GTD+ is based on the discontinued work of the original FreeplaneGTD addon by Auxilus. The plugin is based on the source code available on SourceForge. This plugin is made available under GPL v3. The project sources are available at https://github.com/gpapp/FreePlaneGTD. Thank you for the feedback! It’s great to see it is beneficial for others! Please check out the Mindweb project as well. It enables you to use the features of FreeplaneGTD, with compatibility, but also provides a web viewer for Freeplane files! thank you for providing the GTD+ addon for freeplane. I have a question about customizing the pre-set icons. Its simple as that: If i change the icon, as described above, in the “settings”node, e.g. i create a node like- § Icon: Next Action , it doesn work. All new tasknodes i create afterwards with the *”newtask” command are still formated with the pre-set icons, in this case the usual- ! “newtask”. I read through literally all information i could find here and in freeplane forum but found no issues about it. the errors also occure in the stable freeplane version. Please mind the cases. It shoud be written as “Next action” with a lower case a, not capital. Please tell me if I put it differently in any of the known documentation, so I can fix it! so this was easy in the end. You wrote it with capital A in your gtd-template map description. 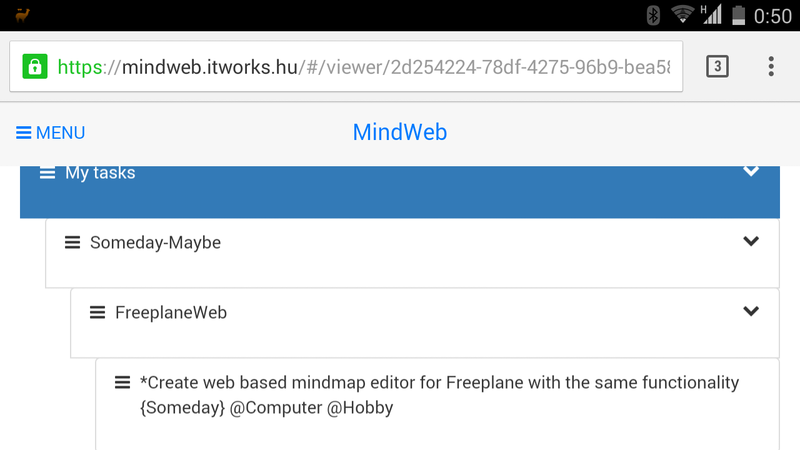 I played around with your Mindweb app and i think its really great work ! Considering all the opportunities opening up for developing group based work, this could in fact become a big deal. If youre interested, i have some projects in the pipe and would love to test it and provide feedback/testing/ideas for your further work on it. How can I make a translation to Freeplane GTD+? after several tries to enter the values on my GTD-Mindmap, I realized, that the translation to German was bad. I now try to find the translation and send it to you via Email, but in the meantime: By editing the gtd-action-node you have actually Cancel –> Schließen and Save/done –> Erledigt (meaning “done” as Item closed but not meaning “save the entry”!) you should have: Cancel –> “Abbruch” and Save/done –> “Speichern”. Nice add-on. Problem I have is a lot of nodes with leading * that are automatically turned into tasks. This happens primarily with bulleted text and PL/SQL code. Any chance of having the leading character configurable? I’d love to go back to using it. I’m sorry to hear your issue with the task parser! The add-on is quite complex as-is, and I don’t want to introduce another complexity layer, by changing the entire parser to configurable. There are quite a few ways you can avoid the automatic parsing though. GTD shorthand only parses simple, unformatted text. Easiest is to convert them to expressions by surrounding it with expression markup. eg. =”your text here” or =’your text here’ Now this might cause problems if your content has both kind of quotes to start with. It is much better, if you use the node details to store such snippets. It is collapsible on the map, and you can even attach source code to GTD tasks. I really appreciate your addon and I’m using it daily. Some months ago I changed pc to a microsoft Surface pro 4, currently the list of activities has standard characters that are very narrow in the “GTD next actions” , is there a way to increase/change that size? (I’m using FP 1.6.2 beta3 with your addon 1.9.3). if you read the About page of the “GTD next actions”, you will read 6 rows, all characters are smaller than with other resolutions (here I have 2736×1824), but especially the 3rd, 4th, 5th and 6th row are really at limit, therefore how is it possible to set those writings to a bigger size? Thanks. Regards and compliments for the addon. I think I know what’s the root cause of that issue is. The high DPI devices (even my cheapo Chineese tablet, that I type on) are not quite compatible with legacy Java applications. See here(https://superuser.com/questions/988379/how-do-i-run-java-apps-upscaled-on-a-high-dpi-display) for description of the issue. The bad news is, that even if Freeplane itself is fixed, there is another issue in the add-on, the core of the HTML browser I use for displaying the action list will still have the issue. The good news is, that I’m already working on a new version of the add-on, that will use the browser built-in to the Java runtime. That should solve the issues. As a quick fix, you can dig in, and modify the FreeplaneGTD.groovy in your userdir, and add a “font-size:20px;” to the body tag in around line 317. That should increase the base font size of the entire actionlist. Play around with the size to see if it helps. And some more bad news, I don’t have much time to work on it, so don’t expect too much progress with it in the next month or so! Do not worry about addon update, with your suggestion I’m reading very well and capable of change it. Tasks can be defined either by using textual shortcuts or icons. Textual shortcuts are explained above, in short start your node with an *. Icons can be redefined as described above, but by default the ! is used to mark node a task. Thank you very much for this very useful addon. Recently I realised I can’t see the Ctrl+H evoked list of actions anymore. Before it was working well on the same map. Please refer to the https://github.com/gpapp/FreePlaneGTD/issues and report your problems. Attach the entire logfile from your freeplane session which failed and describe the actions that lead there. It’s very likely you have upgraded your Freeplane and use an older version of the addon. only one issue in GTD ‘next actions’ window: with Freplane 1.7.3 version, the titles of summaries (project, context, who) are displayed after the ‘actions lists’. That’s a known issue with Freeplane 1.7+. The new beta version fixes those issues.